The MCA series of asynchronous servo motors is available in both a self-ventilated version or with a blower, and feature rated torque values of up to 61.4 Nm & peak torque values of up to 300 Nm. When compared to standard 3-phase AC motors, the MCA servos deliver higher maximum speeds at reduced weight and lower moments of inertia. The MDSKA/MDFKA motors have a durable, rugged squirrel-cage design. These lean servos feature reinforced insulation and enamel-insulated wiring to thermal class H, and have a power range of 800 W � 20.3 kW. Highly dynamic performance and adaptable structure. The MDFQA line of asynchronous servo motors feature through-blown ventilation and are available as compact sub-assembly drives. A preferential type with resolver feedback is offered for high-precision applications. 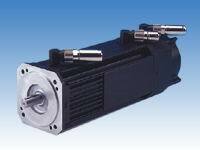 Like all of Lenze�s asynchronous servo motors, compact design, reliability, and performance are all hallmarks of the MDFQA series. Constructed for exceptionally long service life, many Lenze asynchronous servo motors can be easily repaired rather than replaced. Contact TigerTek to order your servo motor repair today.